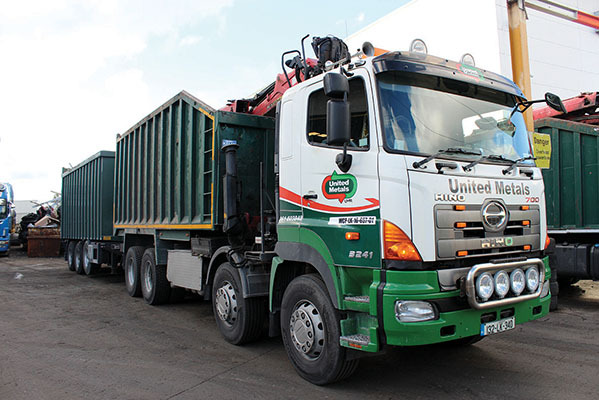 United Metals, also known as United Metal Recycling (Ireland) Ltd, is a family-run recycling business specialising in demolition services, waste management, material valuation, truck collections and skip hire. David Hegarty explains more. Based in Limerick, United Metals is Ireland’s most dynamic metal recycling company. It was established six years ago after six senior managers left the company formally known as Hegarty Metals to form United Metals (UMR) in the hope of returning the long-standing tradition of having a family-run metal recycling business in the Mid-West city. The company’s directors are brothers David and Eoin Hegarty, whose father John owned the aforementioned Hegarty Metals. The demolition end of the business is headed up by Tony Donlon, previously of Munster Metal. “United Metals was a coming together of personnel with a wealth of experience in the metal recycling industry,” David says. United Metals has quickly grown to become the dominant business of its kind in the Munster region due to the collective expertise, hard work and dedication of the people involved from the ground up. The company is passionate about delivering the best customer service possible and boasts an ever-expanding nationwide client-list which includes local authorities and customers from the industrial, bio pharma, agricultural and quarrying sectors. UMR can export all materials bought, directly into the international markets, which allows it to provide the most competitive price. This is done from its site at Limerick Port where, thanks to its accreditation and unique processing abilities, it turns your waste into a product that can be shipped freely into mills all over the world. The company operates under the ISO 9001:2008 quality management system and is focused on not only maintaining this standard, but improving on it by seeking out the most efficient and cost-effective solutions for clients in order to keep them ahead of the curve. Offering both small and large-scale demolition services, United Metals has teams of demolition crews who can complete the most complicated jobs, with minimum impact to surrounding environments. Demolition services include mobile and fixed plant decommissioning, industrial demolition, factory strip out and decommissioning and marine vessel decommissioning. United Metals has invested heavily in the most modern plant and equipment, working closely with companies such as Liebherr in Killarney to custom-build material handling and demolition equipment which is flexible enough to adapt to any job. When it comes to waste management, the Ballysimon-based concern can provide a full set of reports on a monthly basis to companies detailing the collections that were done, and offering a comprehensive and tailored solution to individual customers based on their requirements. United Metals’ qualified and experienced team can carry out a basic waste management audit at your facility, at no obligation, to offer solutions to problems companies face in streamlining an aspect of their business that typically is seen as a liability, and turn it into a clean, compliant revenue stream. The company has an in-house design and engineering facility, which enables it to build bins and skips to suit the requirements of specific customers. United Metals can carry out non-destructive testing on specialist material, and with its extensive network of international markets, can secure you the best possible prices and outlet for your product. The company handles and recycles all types of metal and materials, including steel / cast iron, aluminium, cast aluminium, copper, batteries and electric motors. 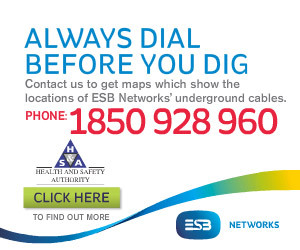 For the most competitive quotes in the business, telephone 061 603848. UMR also supplies a wide range of skips to suit all needs. It can provide a one-off drop and collect or a regular skip exchange service. The two types of skip services available are ‘Roll On / Roll Off’, also known as ‘Hook Lift’, and Chain Lift Skip. The company has an extensive and diverse fleet of trucks to suit any situation or load, including articulated grab trucks, rigid 4-axle trucks, truck and trailer combinations, hook lift skip lorries and chain lift skip lorries. The 15-strong fleet of Scania and Hino trucks is complemented by a dozen trailers, which are a mixture of curtain-siders, flats, tippers and drag trailers. “Most of our trucks and trailers are made to specification. We have eight full-time drivers who are reliable, professional and courteous. We employ 35 staff in total,” David explains. As a company which takes great pride in the appearance of its green and white branded fleet, it’s no surprise to hear it’s a regular at the various truck shows that take place around the country. “Our newest truck, which is a 141-registered Scania P440, has done a number of the shows. Our other show trucks are a Scania P400 with hook loader and a Scania R420 with crane. Mike O’Connor and Darragh Whelan put a lot of work into getting the trucks ready and having them in pristine condition. United Metals’ commitment to the environment and recycling is reflected in its investment in a new water recovery system in each of its three buildings in Eastway Business Park. This makes the company completely self-reliant on water usage, meaning costs are reduced and less pressure is placed on local water demands. Opening hours are from 8am to 5.30pm Monday-Friday and from 8am to 12.30pm on Saturdays.